I have been afforded the opportunity to be involved in several organizations which have helped me grow and flourish as a leader. I am a proud member of the Beta Upsilon Chapter of Alpha Kappa Alpha Sorority, Inc., where I have served in numerous leadership roles including Vice President where I plan large-scale programs and events to enrich the lives of the student body. I am also heavily involved in community service initiatives; as Miss Dillard, one of my primary roles is to plan and implement campus-wide service projects to connect Dillard students with the surrounding Gentilly community. These events have not only contributed to my personal growth but will also leave a legacy for years to come. I am a proud member and four-year veteran of the Bleu Devil Cheer Squad, where I cheer on our athletic teams and encourage students and the community to take pride in our Fair Dillard. As president of the African World Network Organization, I am able to learn more about the African diaspora and see first-hand connections between our current society and African culture. I also am very actively engaged in the local legal community through our university's pre-law and Foundation to LEAD programs. I strive to lead a life of service. I hope to serve my community as an attorney and public servant. My goal is to start my own nonprofit organization that uplifts and empowers young women, especially those from small towns and rural communities like my own. I want to ensure these young women are exposed to the variety of careers and experiences the world has to offer. In my formative years, I realized the impact of having successful African American women serve as role models and teachers for young women in the community to aim high and strive for greatness. As a college student I have seen the influence I have had on my small town community, and now as queen I have a greater impact. 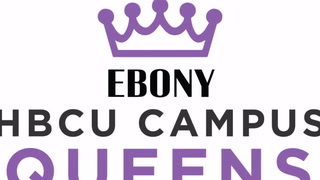 Being selected as an Ebony Campus Queen will allow me to expand this impact beyond my community to the nation, and it will allow me to serve as a role model for young women for years to come. My most memorable contributions have been the women empowerment events that have allowed me to connect and motivate women on campus and the community as a whole. As queen, my favorite event thus far has been an event titled "Dear Me". During this event the ladies of the freshman class and I discussed our "non-negotiables" - things we are unwilling to change and the things that make us who we are. We then explored our "mind openers", which are things we would like to learn more about. The event ended with the ladies writing letters to themselves which they will receive at the end of the Fall 2018 semester. This event taught us it is important to have balance and that we are more alike than we originally thought. A second event is a discussion series titled Conversations with the Queen, a partnership with the Nyota Circle, a women's initiative on campus, that creates positive places for intimate discussion on topics such as body positivity, relationships, mental health, and professional development. I also enjoy serving and engaging women within the New Orleans community through services that directly enhance their quality of life.